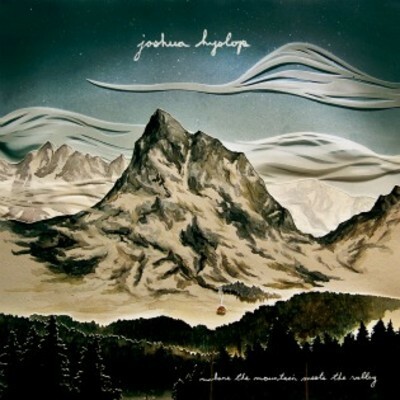 If I could only use one word to describe Joshua Hyslop’s music, the word would undoubtedly be “soothing.” Hyslop’s breathy vocals are unique and have the uncanny ability to make almost anything he sings sound really, really sad. But there’s definitely room for sadness in Where the Mountain Meets the Valley. Hyslop spends the first two songs at least in part wondering about what will happen when he dies, and that’s certainly something we all think about whether we like it or not. These are followed by another sad song, this time a duet with Anna Scouten called “What Have I Done.” The song does pick up a little more as it adds in some banjo and some drums so it doesn’t dissolve in its own tears. The songs aren’t all reflective and sad, such as the uncharacteristic “The Mountain.” While it certainly sounds like Hyslop, the song is much more upbeat and much shorter than the others. Hyslop still manages to pack a message into it, though, showing that not every one of the album’s songs has to be four minutes or more. “Wish You Well” is also a nice upbeat number. Another uncharacteristic song, and perhaps the most powerful on the album, is “Have You Heard.” While many songs are, as I said, reflective and pondering, this one actually comes across as more confrontational. I think Hyslop mentions something about someone needing guidance in hell, and the instruments give the song an added power that I would have loved to hear even more of on the album. This is a pretty solid collection of tracks, and Hyslop has a very unique set of vocals, so there’s definitely a place for him on the singer-songwriter scene. I’d love to see him make some more powerful songs this time around. Where the Mountain Meets the Valley is available on iTunes.